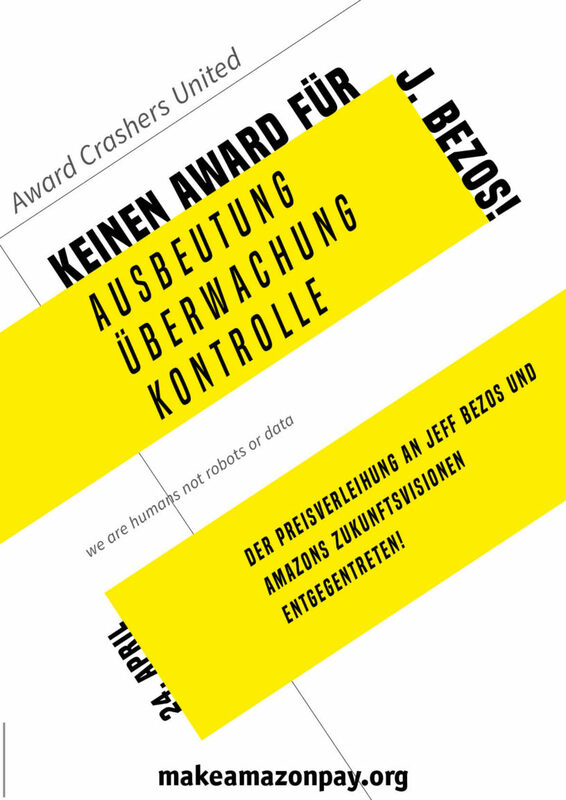 Award Crashers United - Springer-Party for Jeff Bezos? We come to disturb! - Make Amazon Pay! Axel Springer-Party for Jeff Bezos in the middle of Berlin? We come to disturb! 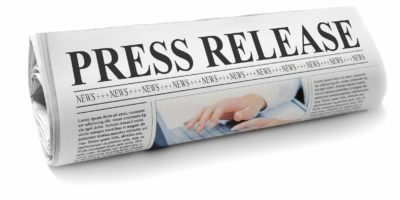 On April 24 2018, Axel Springer Verlag (publishing house of the well-known Bild newspaper) is organizing a special kind of party event. Jeff Bezos, head of global online retailer Amazon and richest man in the world, will be honored with the „Springer Prize“ for his „visionary business model“. What disguises the praise of the Springer press is that Amazon is above all a “visionary” exploitation model. Its successes are the perfect model of how work in digital capitalism can be increasingly disenfranchised and precarious. Amazon pretends to simplify life for everyone, yet, behind the façade stand: Anti-unionism, downward wage pressure, work hounding and permanent monitoring. Bezos “visionary” exploitation model leads to high levels of illness as well as mental and physical long-term damage to employees. “Amazon makes us sick”, the employees at Amazon shout and mean this not symbolically, but literally. 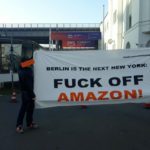 Amazon concerns us all – even if we don’t work there! On the one hand, because this exploitative working model is able to assert itself in the event of a possible success of the zero tolerance policy of Bezos and Co. on other companies and sectors. So it is not only the working conditions at Amazon that are decided here, but also the future conditions of work in the 21st century. On the other hand, because Amazon, as one of the “Big Five”, the five big Internet giants, is a pioneer for the penetrating access to our most personal data. Our preferences, desires and fears are completely examined and allow access to more and more areas of life. The aim is to generate profit by influencing our needs and satisfying them at the same time, so that we are becoming increasingly dependent on this conglomerate of digitally active companies. We do not leave the determination of our future and our needs to Bezos and Springer-Verlag! Their future, in which employees are disenfranchised and customers only act as data donors, will not be our future! At Amazon, central tendencies of current capitalism, but also of resistance to it, intersect. 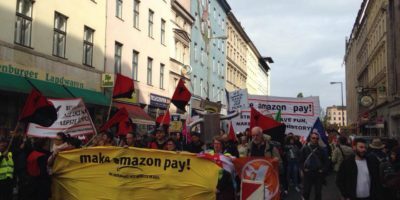 Simultaneous strikes in the European distribution centres and simultaneous blockades of Amazon trucks’ access routes are on the agenda. Hacking Amazon’s homepage to stop the flow of data for a few moments. The public attack on the great story of Amazon as a service provider to humanity for the 21st century. We call, let us cross the resistance, let us be a picture of a future of solidarity! Face the award ceremony for Jeff Bezos and Amazons vision of our future!